1. In the beginning was Initiation. The flesh profiteth nothing; the mind profiteth nothing; that which is unknown to you and above these, while firmly based upon their equilibrium, giveth life. 2. In all systems of religion is to be found a system of Initiation, which may be defined as the process by which a man comes to learn that unknown Crown. 3. Though none can communicate either the knowledge or the power to achieve this, which we may call the Great Work, it is yet possible for initiates to guide others. 4. Every man must overcome his own obstacles, expose his own illusions. Yet others may assist him to do both, and they may enable him altogether to avoid many of the false paths, leading no whither, which tempt the weary feet of the uninitiated pilgrim. They can further insure that he is duly tried and tested, for there are many who think themselves to be Masters who have not even begun to tread the Way of Service that leads thereto. 5. Now the Great Work is one, and the Initiation is one, and the Reward is one, however diverse are the symbols wherein the Unutterable is clothed. 6. Hear then the history of the system which this lection gives you the opportunity of investigating. 7. Some years ago a number of cipher MSS. were discovered and deciphered by certain students. They attracted much attention, as they purported to derive from the Rosicrucians. You will readily understand that the genuineness of the claim matters no whit, such literature being judged by itself, not by its reputed sources. 8. Among the MSS. was one which gave the address of a certain person in Germany, who is known to us as S.D.A. Those who discovered the ciphers wrote to S.D.A., and in accordance with the instructions received, an Order was founded which worked in a semi-secret manner. 9. After some time S.D.A. died: further requests for help were met with a prompt refusal from the colleagues of S.D.A. It was written by one of them that S.D.A.’s scheme had always been regarded with disapproval. But since the absolute rule of the adepts is never to interfere with the judgment of any other person whomsoever—how much more, then, one of themselves, and that one most highly revered!—they had refrained from active opposition. The adept who wrote this added that the Order had already quite enough knowledge to enable it or its members to formulate a magical link with the adepts. 10. Shortly after this, one called S.R.M.D. announced that he had formulated such a link, and that himself and two others were to govern the Order. New and revised rituals were issued, and fresh knowledge poured out in streams. 11. We must pass over the unhappy juggleries which characterized the next period. It has throughout proved impossible to elucidate the complex facts. We content ourselves, then, with observing that the death of one of his two colleagues, and the weakness of the other, secured to S.R.M.D. the sole authority. The rituals were elaborated, though scholarly enough, into verbose and pretentious nonsense: the knowledge proved worthless, even where it was correct: for it is in vain that pearls, be they never so clear and precious, are given to the swine. The ordeals were turned into contempt, it being impossible for any one to fail therein. Unsuitable candidates were admitted for no better reason than that of their worldly prosperity. In short, the Order failed to initiate. 12. Scandal arose and with it schism. 13. In 1900 one P., a brother, instituted a rigorous test of S.R.M.D. on the one side and the Order on the other. 14. He discovered that S.R.M.D., though a scholar of some ability and a magician of remarkable powers, had never attained complete initiation: and further had fallen from his original place, he having imprudently attracted to himself forces of evil too great and terrible for him to withstand. The claim of the Order that the true adepts were in charge of it was definitely disproved. 15. In the Order, with two certain exceptions and two doubtful ones, he found no persons prepared for initiation of any sort. 16. He thereupon by his subtle wisdom destroyed both the Order and its chief. 17. Being himself no perfect adept, he was driven of the Spirit into the Wilderness, where he abode for six years, studying by the light of reason the sacred books and secret systems of initiation of all countries and ages. 18. Finally, there was given unto him a certain exalted grade whereby a man becomes master of knowledge and intelligence, and no more their slave. He perceived the inadequacy of science, philosophy, and religion; and exposed the self-contradictory nature of the thinking faculty. 19. Returning to England, he laid his achievements humbly at the feet of a certain adept D.D.S., who welcomed him brotherly and admitted his title to the grade which he had so hardly won. 20. Thereupon these two adepts conferred together, saying: May it not be written that the tribulations shall be shortened? Wherefore they resolved to establish a new Order which should be free from the errors and deceits of the former one. 21. Without Authority they could not do this, exalted as their rank was among adepts. They resolved to prepare all things, great and small, against that day when such Authority should be received by them, since they knew not where to seek for higher adepts than themselves, but knew that the true way to attract the notice of such was to equilibrate the symbols. The temple must be builded before the God can indwell it. 22. Therefore by the order of D.D.S. did P. prepare all things by his arcane science and wisdom, choosing only those symbols which were common to all systems, and rigorously rejecting all names and words which might be supposed to imply any religious or metaphysical theory. To do this utterly was found impossible, since all language has a history, and the use (for example) of the word «spirit» implies the Scholastic Philosophy and the Hindu and Taoist theories concerning the breath of man. So was it difficult to avoid implication of some undesirable bias by using the words «order,» «circle,» «chapter,» «society,» «brotherhood,» or any other to designate the body of initiates. 25. Now when P. had thus with bitter toil prepared all things under the guidance of D.D.S. (even as the hand writes, while the conscious brain, though ignorant of the detailed movements, applauds or disapproves the finished work) there was a certain time of repose, as the earth lieth fallow. 26. Meanwhile these adepts busied themselves intently with the Great Work. 27. In the fullness of time, even as a blossoming tree that beareth fruit in its season, all these pains were ended, and these adepts and their companions obtained the reward which they had sought—they were to be admitted to the Eternal and Invisible Order that hath no name among men. 28. They therefore who had with smiling faces abandoned their homes, their possessions, their wives, their children, in order to perform the Great Work, could with steady calm and firm correctness abandon the Great Work itself: for this is the last and greatest projection of the alchemist. 29. Also one V.V.V.V.V. arose, an exalted adept of the rank of Master of the Temple (or this much He disclosed to the Exempt Adepts) and His utterance is enshrined in the Sacred Writings. 30. 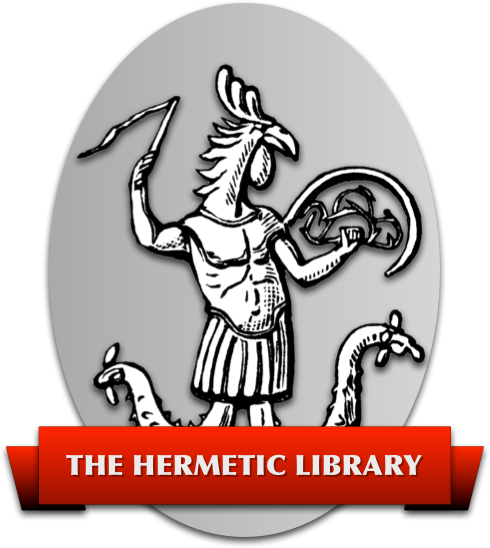 Such are Liber Legis, Liber Cordis Cincti Serpente, Liber Liberi vel Lapidis Lazuli and such others whose existence may one day be divulged unto you. Beware lest you interpret them either in the Light or in the darkness, for only in L.V.X. may they be understood. 31. Also He conferred upon D.D.S., O.M., and another, the Authority of the Triad, who in turn have delegated it unto others, and they yet again, so that the Body of Initiates may be perfect, even from the Crown unto the Kingdom and beyond. 32. For Perfection abideth not in the Pinnacles, or in the Foundations, but in the ordered Harmony of one with all.